Here at D Cross Barn Company, we specialize in post-frame buildings. Post-frame buildings are an easy cost effective way to build a quality structure. If you have never learned about post-frame buildings you may not know about the many advantages that they offer. Here are just a few reasons why you should consider a post frame building for your next building project. 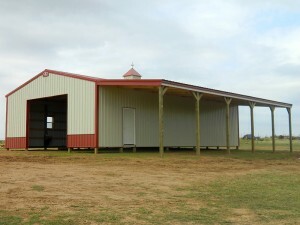 Pole barns can be constructed at a very rapid pace. You can get “under roof” in about half as much time as alternative construction techniques. The reason is that it takes much less work to build a post frame building. The framing members are larger so not as many are needed. You can also build during almost any weather so you can build any time of year. You can add concrete flooring later on after the building is complete so it doesn’t require dry weather. Since constructing a pole barn is very fast and efficient, your cost for labor will be much less then it would be for other kinds of construction. Particularly so if you don’t require a complete concrete foundation. Also, wood is usually a much lower price than steel, brick, or concrete blocks. If you decide to go with steel for your siding and roof, your pole barn price will be even lower. Steel can be installed very quickly which will save you even more money on labor costs. Another advantage of post-frame buildings is their flexibility. It is easy and cost effective to add additional elements like overhangs, a steeper roof, a porch, etc. On a steel frame building this would cost much more. Post frame builds don’t require interior walls for support so you can design the inside however you want; and it will be easier to build those walls with a post-frame building. Another advantage is that the supporting columns can be placed 8’ apart, making it easy to add additional doors and windows later on. Unlike a stud wall which is much more challenging and expensive to add spaces in. Pole barns also have a variety of exterior options beside steel. You can use brick, block, wood, vinyl, almost anything you want. Because the columns go all the way into the ground they make the building more stable and resistant to the wind. The horizontal connecting posts create a strong box shape that increases the ability for the building to resist wind and seismic disturbances. Directly attaching the trusses to your post-frame make it almost impossible for your roof to separate from the rest of the structure. The post-frame structure creates a diaphragm effect that gives it the ability to flex and bend under stress rather than crack, crumble, or collapse like other structures would. Post frame buildings have large wall cavities. These can be very easily filled with a thick insulation. In addition the wood post columns conduct very little heat in or out. Steel frame buildings conduct heat at a much faster rate. This makes them very difficult to insulate well. Concrete block buildings are even more difficult and expensive to insulate because concrete itself has almost no insulative ability whatsoever. A post-frame build uses wood framing. Wood is a renewable resource and with responsible usage it will not contribute to deforestation. Unlike other building materials it will remove carbon dioxide from the air rather than release it as gas and adding to the greenhouse effect. Since post frame buildings are built with large columns spaced several feet apart, there are fewer materials required to hold the required weight. This means the required labor and fuel will be lower. Post-frame buildings usually use steel for their siding and roofing. This steel is usually made from recycled steel. Interestingly, steel production uses less energy and creates less pollution then alternative masonry building products. But the recycling doesn’t stop with steel. You could actually completely disassemble your post-frame building and recycle all the components. Now you know why post-frame buildings are such a popular building choice. With so many distinct advantages it is an easy choice to go with a post-frame building. If you need a new building we strongly recommend a post frame structure. Please contact D Cross Barn Co. for more information!